How Preventive Maintenance Helps Your Car Brakes To Keep Working? Brake system of your vehicle is considered to be one of the most important safety means of your vehicle. While you slow down your car in heavy traffic or stop at a red light, your brakes are at work. Overtime usage of the car brake leads to wear and tear, and thus it can become useless. Thus it is important to maintain the brake system from time to time. Take help from car mechanics, they are well versed in repairing all kinds of car issues, they will repair your brake. How Does Your Car Brake Work? 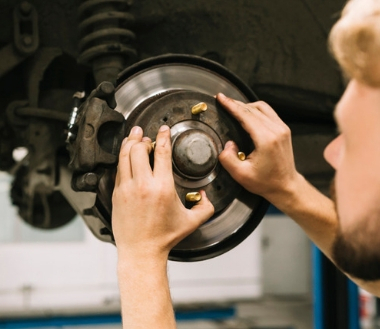 Brake system in your vehicle comprises of a disc, the disc is called a calliper, a rotor, and the brake pad. The whole thing may seem to you quite simple from outside that you are giving a push on the brake pedal and the vehicle stops. But from inside it is a little bit complicated. As the piston moves in the master cylinder, the depressed pedal sends brake fluids via brake lines. Now since the pistons in the callipers get started, the brake shoe gets pushed against the rotor and thus friction occurs on the brake drum. And the pressure created by your brake pad will slow down the vehicle and at the end, it will stop the vehicle. So, you can see that your brakes are powered by lots more than a simple pedal on the floor of your vehicle. Your car takes a hard toil before it finally stops safely and timely on the road. Brake pad replacement is one of the simplest jobs that car owners try to do on their own. However, if you are not well equipped, you should not try it instead you should leave it to the professionals. You may save a few bucks by doing it yourself, but if the pad does not fit properly if the calliper gets damaged, then your car will be rendered unsafe on the roads. So, you should seek professional help, the car mechanics are experts in clutch and brake repairs. The daily friction of your car brakes is responsible for your brakes pads to wear down, so you need to replace it from time to time. It will ensure you and the safety of your car. It is a part of preventive maintenance routine and this routine will keep your car in the working condition throughout. This is all about car brake and preventive maintenance helps in maintaining the car brake to function normally throughout. You can find several car mechanics in Chirnside Park. Hire a car mechanic, spend a few bucks and get your brake inspected. Liked this post? Stay connected to our blog space for more such interesting updates. You should get in touch! © 2019 by Lilydale Motors All Rights Reserved.